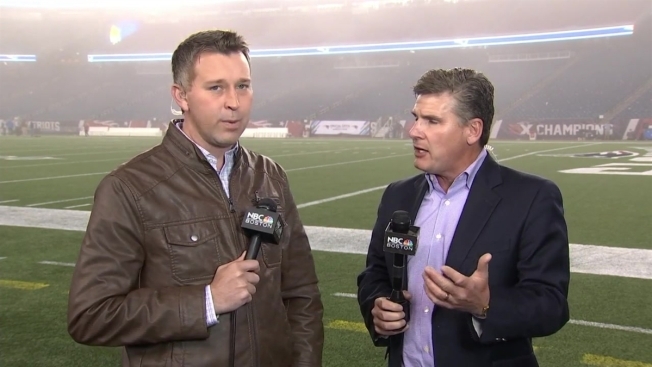 NBC Boston's Raul Martinez and Kevin Walsh break down Sunday night's Super Bowl LI rematch. The New England Patriots beat the Atlanta Falcons in a 23-7 victory at a fog-filled Gillette Stadium in a much-anticipated game. The New England Patriots turned a corner in capturing their third straight victory on Sunday night, this time taming the Atlanta Falcons in a dominating 23-7 win. The biggest leap forward for the Patriots, though, was probably made in the run game, which helped them control the game after being mostly underwhelming for most of the season. Offseason acquisition Rex Burkhead was back after missing the four previous games with an injury to his ribs. It gave New England a full complement of running backs for the first time since Week 2. It paid off with the Patriots rushing for a season-high 162 yards, their highest output since their season-opening loss to Kansas City. Dion Lewis led all rushers with 76 yards on 13 carries. Those aren't huge numbers, but it's progress for a team that's still adjusting after it parted ways with LeGarrette Blount in free agency this past offseason. Coach Bill Belichick said he thinks the improvement is a product of better overall execution in recent weeks. "The more runs you have, the more yards you're going to gain," he said. "We played the game from ahead, which what was a switch. We hadn't had a ton of that this year, so that gives you the opportunity to have the ball more." New England had only four regular-season games in 2016 when it ran the ball fewer than 25 times. Entering Sunday night, it had already had four such games. The Patriots ran a season-high 36 times against Atlanta, as compared to 29 passing plays. Quarterback Tom Brady said that balance was key in helping them maintain a more than eight-minute advantage in time of possession. "That was important," he said. "We did a great job staying balanced ... and we ran the ball really well, really efficiently." Under Belichick, New England has never been a run-dependent offense. It has instead utilized its backs mostly via short passing routes and jet sweeps which have effectively served the same purpose as short-yardage run plays. James White's receiving touchdown Sunday was his first score of the season. But the Patriots were somewhat spoiled by Blount's breakout 2016 season that saw him average nearly 75 rushing yards per game to go along with an NFL-leading 18 regular-season touchdowns. They decided not to re-sign the 30-year-old Blount, and instead brought in 26-year-old Mike Gillislee. He has scored four touchdowns thus far, though hasn't reached the end zone since Week 2. He's also yet to rush for more than 69 yards in a game this season. But Gillislee's strengths aren't in short-yardage situations. That's where Burkhead's return is helpful. He thrives in those 1- to 2-yard situations, but also has burst. He showed it when he had three separate gains of 9 yards in a drive in the second quarter to set up Stephen Gostkowski's 29-yard field goal. "We've got so many backs than can do multiple things," Burkhead said. "When you have that versatility, it really helps us out as an offense and as a unit, so we love that." Lewis said Sunday's output is validation that this group can produce at a higher level. "Everybody's running hard and doing whatever it takes to win," Lewis said. "You've just got to compete. The best thing you can do is compete, just trying to prove that you deserve to be out there."